I’ve little interest in fashion, and I think it’s almost 50 years since I bought something because it was fashionable. It was for going to university in 1963, really the first time I bought clothes for myself, and I wore denim jeans (skin tight that took some getting on and off) and a black polo neck under a sports jacket, just like the pictures I’d seen in the newspaper fashion pages. Most of the others in my classes still wore suits and ties. I kept wearing polo necks for years, partly because in my first real job there was a dress code – men had to wear a tie. With the polo neck, my boss couldn’t tell that I wasn’t wearing one (and often not even a shirt) and somehow I got away with it. And I still almost always wear ‘designer’ jeans. It began not as a fashion statement but for medical reasons. I’d fallen heavily on my backside one summer around 1980, with painful consequences, and eventually had to have a minor operation, which left me very tender. For weeks I couldn’t sit down without a rubber ring to sit on- and even that required considerable care. Wearing trousers was painful too, I was only really comfortable in a very light pair of summer-weight pyjamas, hardly the ideal kit for going out in. Sitting cautiously in the doctor’s waiting room I read one of the old magazines left there. It’s the only place I ever read ‘Country Life’ or ‘Vogue’, but on this occasion I think it was some kind of magazine for walkers or outdoor life in some way. And there I read a review of Rohan Bags, which told me that they were tough but so light you had to look to check you were actually wearing trousers. It was I thought worth a try, and sent off for a pair that afternoon. Sitting here writing this, I’m still wearing Bags, though not the same pair, but the design has changed little. They are comfortable, practical and reasonably hard-wearing, though they don’t quite stand up to the rigours of a photographic life, and I often have to ask my wife to patch the knees. In a ruck outside the Israeli embassy a few years back one of the pockets got torn halfway off and I lost a CF card with most of my pictures on it, and covering the May Day march one year I heard a loud tearing sound as I knelt rapidly to photograph a group of children, and found a split up the front from crotch to waist – I spent the rest of the day photographing with my jacket tied around my waist as a skirt to keep me decent. But generally they are great, and I can’t live without the four large pockets to (usually) keep things secure. I’ve tried others but I always come back to Bags. Rohan’s various jackets too are among the best, and I now seldom go out in anything else, and my two favourite jumpers are also from them. Rohan has been described in the Daily Telegraph fashion column as “a British brand to relish, both for its practicality and glorious immunity to fashion”, and its an immunity that appeals to me. But although the designs are British they are made internationally, including some in Bangladesh. 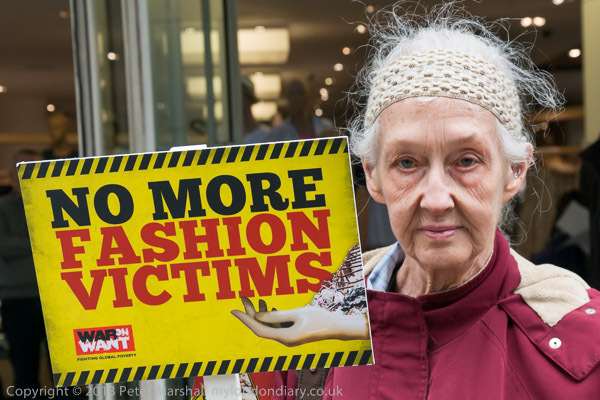 The company has been a member of the Ethical Trading Initiative (ETI) since 2005, working with their clearly set out standards for the treatment of factory workers in areas such as wages, working hours, conditions, forced and child labour which they insist all their garment suppliers sign up to. They regularly visit the suppliers throughout the year and pay independent and highly qualified auditors to check up on them. 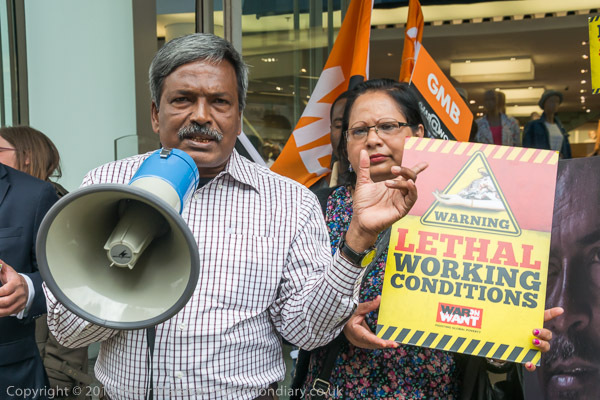 War on Want organised the protest outside GAP as they were one of the outlets for clothing produced in the Rana Plaza factory in Dhaka, Bangladesh where 1,138 workers died on April 24, 2013. 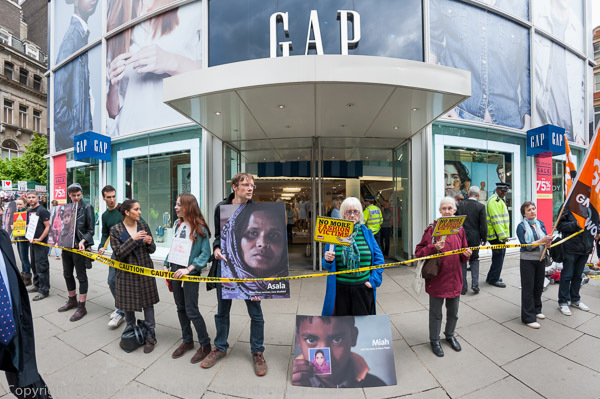 GAP is one of several companies who have refused to sign the Bangladesh Accord for Fire and Building Safety launched by War on Want and their Bangladeshi partners the National Garment Workers Federation. There were quite a few video teams from various media organisations present, always a problem as they all want to do video interviews with anyone at all well known, which often means taking them away from the action for rather long periods. Still photographers want to photograph them in the centre of things, and if they do direct them (I seldom do) and stop the flow of things it is seldom for more than a few seconds. 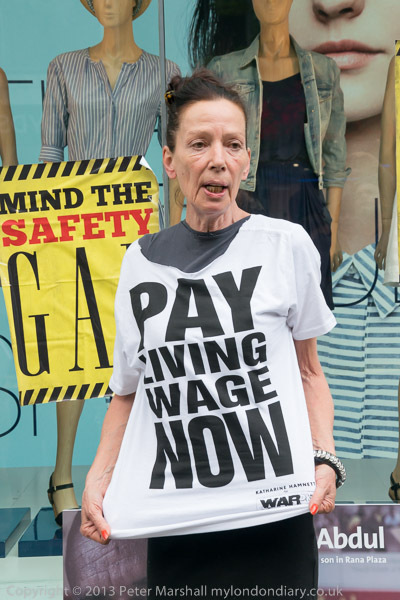 At times too, there was quite a scrum around fashion designer Katherine Hamnett in particular, making it difficult to take pictures. While I think the main media often concentrate far too much on celebrities (and sometimes the actual event can be almost entirely neglected) as someone who tries to sell images to the media I do of course need to take pictures of the main figures at any protest, especially if they are well known. But I try hard to keep a balance. 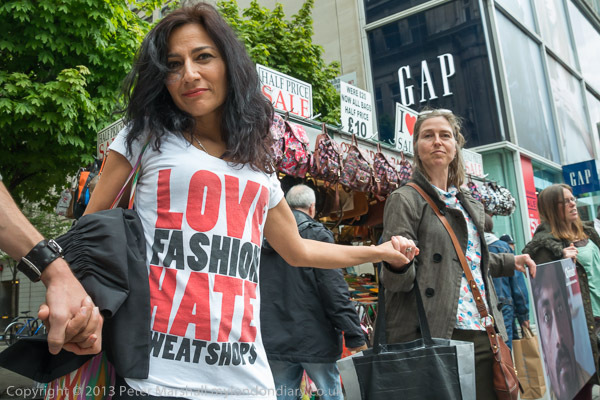 But there are plenty of pictures in Rana Plaza Anniversary at GAP of Katherine Hamnett both modelling the t-shirt design she has donated to War on Want and speaking at the event, as well as of Amin Haque from the National Garment Workers speaking, and a few others of both. 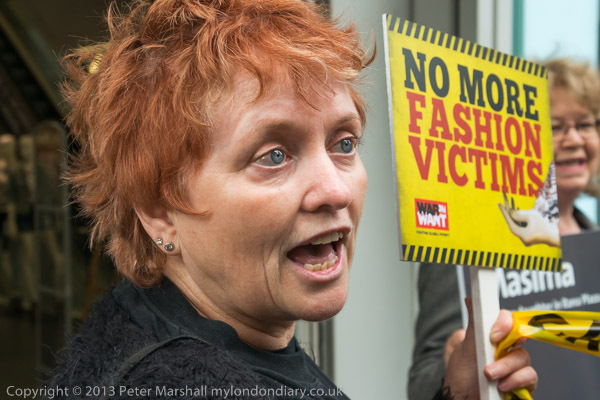 Another public figure taking part in the protest (and in my pictures) was London’s Green MEP Jean Lambert. And this was another occasion where the 16mm fisheye came in useful – used here on the D700. There isn’t any real point putting it on the D800E for pictures like this as you don’t need a 32Mp file. This entry was posted on Wednesday, May 28th, 2014 at 09:42 am and is filed under My Own Work, Photo Issues, Political Issues. You can follow any responses to this entry through the RSS 2.0 feed. You can leave a response, or trackback from your own site.